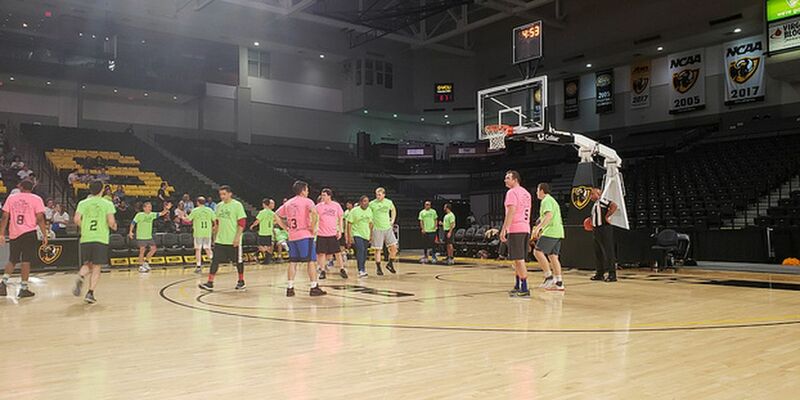 RICHMOND — Despite controversies around the Capitol, Virginia legislators and lobbyists met on the basketball court to raise money for cancer research, with two notable absences: Gov. Ralph Northam and Lt. Gov. Justin Fairfax. Both had participated in last year’s fundraising event that raised nearly $35,000 for research at Virginia Commonwealth University’s Massey Cancer Center. On Friday, a photo surfaced in Northam’s medical school yearbook depicting two individuals, one dressed in a Ku Klux Klan robes and the other in blackface. On Wednesday, Vanessa Tyson, an associate professor of politics at Scripps College in California, publicly accused Fairfax of forcing himself on her in a hotel room during the 2004 Democratic National Convention. The 11th annual Capitol Square Classic was held Wednesday evening at the Siegel Center in Richmond — normally home to the VCU men’s and women’s basketball teams. The two games saw the Senate take on the House, and members of the governor’s office were pitted against a team of lobbyists. Pages from the House and Senate — teenagers who assist legislators during the General Assembly’s session — cheered on their respective teams in front of a crowd of about 200. This year’s event raised over $32,000 for research.